"Granite State" is the fifteenth and penultimate episode of the fifth season of the American television drama series Breaking Bad, and the 61st and penultimate episode of the series. Written and directed by Peter Gould, it aired on AMC in the United States and Canada on September 22, 2013. Ed the "disappearer" (Robert Forster) brings Saul Goodman (Bob Odenkirk) to the basement of his vacuum repair shop. There he finds Walt (Bryan Cranston), who also paid for a new identity and relocation. Walt asks Saul to put him in contact with hitmen so he can kill Jack and his men and recover his other barrels of money, but Saul refuses. Saul tells Walt that by giving himself up, Skyler (Anna Gunn) might still keep their house instead of losing it to the authorities. Walt can only think of giving up once his entire wealth is recovered and given to his family, so he refuses. Walt attempts to coerce Saul into coming with him, but is subdued by a coughing fit. No longer intimidated, Saul bids Walt farewell and leaves for his new life in Nebraska. Jack's gang raids Marie Schrader's house and finds Jesse's (Aaron Paul) confession tape. The gang wants to kill Jesse for being an informant, but Todd wants him to cook more high-quality meth in order to impress Lydia, with whom Todd is now infatuated. Knowing Skyler once met Lydia at the car wash, Todd and some gang members break into the Whites' house and threaten Skyler to keep quiet about Lydia's involvement, and a shaken Skyler complies. Lydia's not convinced Skyler will stay silent, and wants to end their meth operation, but reconsiders after Todd reveals that quality and yield are up because the meth composition is now at 92% purity because of Jesse's work. At Jack's hideout, Jesse uses a paper clip to unlock his chains and tries to run, but is captured. The gang punishes him by taking him to Andrea's house and forcing him to watch Todd kill her. They threaten to kill Brock if Jesse disobeys again. Ed takes Walt to his new location, a secluded cabin in the woods of northern New Hampshire. He is told that he'll be caught if he chooses to leave the cabin and the two acres around it. Walt is tempted from the first day to walk out, but doesn't. A few months later, in a disheveled state, Walt has a full beard and head of hair. Ed arrives on his monthly visit to drop off food and supplies, including an assortment of eyeglasses and a chemotherapy dose. Ed tells Walt that Skyler has returned to using her maiden name, that she works as a part-time taxi dispatcher to earn money, and that she and Walt Jr. have left their house for a small apartment. There is a nationwide manhunt for Walt, and his abandoned house is now in ruins and something of a tourist attraction. A lonely Walt pays Ed $10,000 to stay for an extra hour and play cards with him. Later, Walt stuffs $100,000 into a cardboard box and leaves the cabin. He walks the eight miles into town, stops at the local bar and pays the barmaid to call Walt Jr.'s school pretending to be Marie. Walt Jr. is pulled from class to answer the call, and Walt tries reconciling with him. He tells Walt Jr. that he is going to send money to Walt Jr.'s friend Louis, who should give it to Walt Jr., who should give it to Skyler. Walt Jr. becomes enraged that Walt would attempt to give him drug money, especially after Hank's death. He angrily tells his father to hurry up and die, then hangs up. A dejected Walt calls the DEA and identifies himself, leaving the phone hanging so they can trace his location. However, he sees Elliott and Gretchen Schwartz being interviewed by Charlie Rose on TV about their $28 million contribution for drug rehabilitation in the American Southwest. Walt is angered when Elliot and Gretchen openly dismiss his contribution to Gray Matter Technologies and decides to flee before the police arrive. Bob Odenkirk made his final (pre-Better Call Saul) appearance as Saul Goodman in this episode. On September 18, 2013, it was announced that both "Granite State" and "Felina" would run for 75 minutes including 22 minutes of commercials. The episode title refers to the nickname of New Hampshire, which is where Walt is relocated upon being given a new identity. Parts of the phone call of Walter and Walter Jr. needed to be reshot, because during the transport a Boeing 737 rolled over the film. 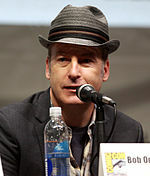 This episode marks the final appearance of Bob Odenkirk as a series regular, as his character, Saul Goodman, fled to Nebraska. Odenkirk returned as Saul in the spinoff prequel to Breaking Bad entitled Better Call Saul. The episode was watched by 6.58 million viewers on its original broadcast. The episode was generally acclaimed, with critics commenting on how the change of pace from the previous week's explosive episode allowed for a more contemplative narrative. Peter Gould was nominated for the Writers Guild of America Award for Television: Episodic Drama for this episode. Robert Forster's guest performance earned him the Saturn Award for Best Guest Starring Role on Television. ^ Couch, Aaron (September 18, 2013). "Breaking Bad: Final Two Episodes Get Extended Run Times". The Hollywood Reporter. Prometheus Global Media. ^ Porter, Rick (July 16, 2013). "'Breaking Bad': New pics, episode titles and everything else we know about Season 5b". Zap2It. Archived from the original on July 19, 2013. Retrieved July 17, 2013. ^ Kondolojy, Amanda (September 24, 2013). "Sunday Cable Ratings: 'Breaking Bad' Wins Night + 'Dexter' Series Finale, 'Devious Maids', 'Real Housewives of New Jersey' & More". TV by the Numbers. Retrieved September 24, 2013. ^ Seidman, Robert (September 23, 2013). "'Breaking Bad' Hits New Highs In Penultimate Episode With 6.6 Million Viewers". TV by the Numbers. Retrieved September 23, 2013. ^ Dietz, Jason (September 22, 2013). "Episode Review: Breaking Bad, "Granite State"". Metacritic. Retrieved September 23, 2013. ^ Ausiello, Michael (December 5, 2013). "Breaking Bad, Orange Is the New Black, House of Cards Lead 2014 WGA Nominations". TVLine. Retrieved December 5, 2013. Tim Goodman (2013-09-22). "'Breaking Bad' Deconstruction, Ep. 15: 'Granite State'". The Hollywood Reporter.